Mexico does not have a national rugby side but this did not stop Andrés Rodrigues Ramos from joining the Wits rugby team. The 22-year-old Mexico City native is an exchange student at Wits University who arrived in South Africa just over a month ago. 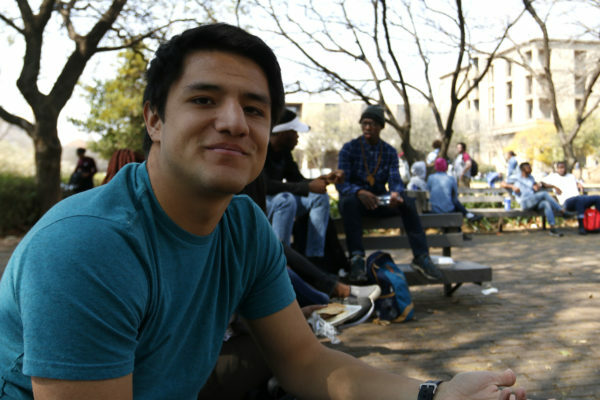 “I ended up here at Wits because I was looking for a place that’s unusual for Mexicans. I wasn’t looking for a Spanish-speaking country because I wanted it to be a real challenge,” Rodrigues Ramos said. “I thought Africa is a place that’s not really popular to go to,” he added. He is in his third year of Industrial Engineering and will be at Wits until December when he returns home. Rodrigues Ramos has been playing rugby in Mexico for eight years. He says that since he started playing for Wits he has constantly been learning more about the game. When not attending classes or rugby practices, Rodrigues Ramos is an explorer. He attended the Super Rugby quarter finals at Ellis Park in July, which he says was a great experience in comparison to usually watching the highlights in Mexico because of the time difference. Rodrigues Ramos describes himself as someone who likes to experience new things. This fuels his desire to travel around South Africa, look for new places, and do different things from what he’s used to. The Orlando Towers in Soweto has caught his eye and he’d like to bungee jump before his semester in South Africa comes to an end. He says one thing that South Africans have in common is that they are “really open and warm people”. He’s quickly made firm friendships with his classmates and rugby teammates and looks forward to seeing more of the country.